USAG Benelux Schinnen is located in the Netherlands, in the city of Schinnen. 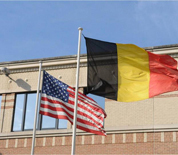 The mission on Schinnen is to provide base operations services to joint, interagency and international communities in support of US interests in NATO throughout the Netherlands, northern Germany and northern Belgium. This USAG Schinnen directory features the critical info you’ll need to navigate through the many facilities and recreational opportunities available on base.